It is undeniable that many things in life are determined by the circumstances of one’s birth -- nationality, genetics and socioeconomic class not least of all. Added to that list, it was the three-hour window in which I was born in June 1985 that determined I’d be focused on justice and live a life defined by wanderlust. Similarly, the time of my partner’s birth almost exactly a year later decided she would be a “straightforward and simple” person who speaks her mind with a strong will. That’s according to fortuneteller Hyo-ri at Moto Saju & Tarot in Itaewon, Seoul. There she looked into the gunghap between myself and my romantic partner of nearly five years. Perhaps our saju would reveal something we had not learned about each other already. 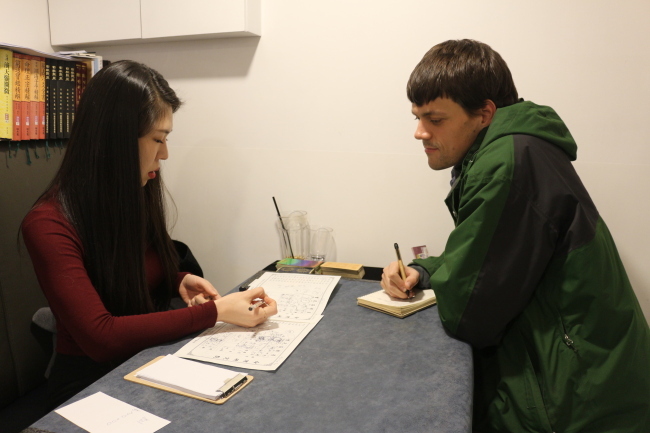 The topic of “gunghap” has been covered in these pages more precisely before, but it is essentially a reading that compares what the fates have decided for a couple’s compatibility based on the astrological system of saju. While most people would caution it is for entertainment purposes only, ask around a little and it is not hard to find stories about relationships sealed or broken based on what fate has preordained. 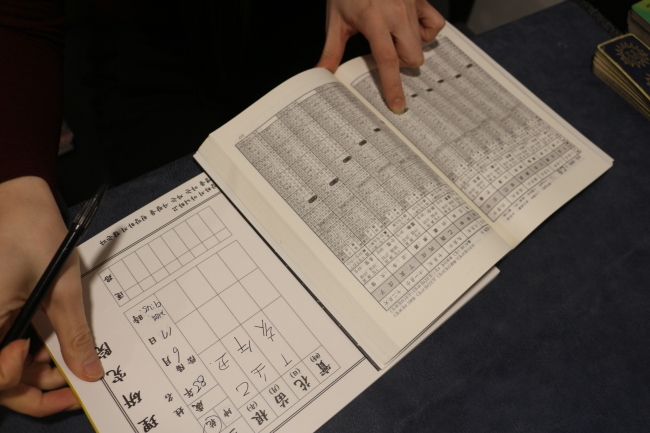 To begin, the fortuneteller jots down the birth year, month, day and time of each subject, then digs through her mystic reference tomes to find corresponding Chinese characters that come embedded with meanings included in the five elements that make up life. While very exacting, time is also apparently relative. I was told there was no need to adjust it even though I was born 14 time zones away. First, the teller let me in on what my saju had to say about me. “Personality wise, you are focused on justice and choosing the right path, and you care about loyalty to other people,” Hyo-ri began with a bit of flattery before jumping into the jargon. “Your fortune sits on ‘yeokmasal,’ which basically means wanderlust,” she went on. “So you might work in different countries.” Not a bad guess, to state the obvious. Over the next several minutes I learned that this would be an OK year to get married if I really wanted to, but 2023 would be best. From 2022, things would really begin to look up for me both professionally and personally, and that would be the best time for new opportunities. I couldn’t help but think it was convenient that if things didn’t work out that far in the future, I probably wouldn’t be able to find her again to press for a refund. Next, we delved into what my partner’s saju had to say. As I was left to chew on whether that was true, reductive, or both, she plowed on to fill in more details, including that my partner’s saju deemed her as fit for an oratory profession, or that involves her hands. “She’s very skilled in diverse fields,” the teller added. While my five elements were in balance, my partner’s traits were marked very heavily by fire. And actually, I had other hidden elements in addition that were cold -- water and metal -- but even her hidden traits were still blazing hot. A previous expert interviewed by The Korea Herald in 2014 had said that water was not a good match for a strong fire-type person, as water extinguishes fire. I could only assume that had not changed in the time since. “Water and fire, cold and hot, yin and yang -- you’re a really good match,” my smiling seer said, reassuring the fates would approve of our cosmic union. “All the luck you lack for making money, she has,” she laughed. As I wondered if the gunghap scheme might be part of a ploy to push more couples into marriage and increase the meager birthrate here, I was thrown for a curve. “Both of you don’t really need to have children,” Hyo-ri prognosticated. “The kid will grow up well, but you two have to survive too, and be happy. Through bringing up a child, your energy will seep out.” I could not fault her logic. There was actually little I could find at fault about the advice given, even if I remained unsure as to the basis of that advice. I came expecting to glean life hacks on how to align myself with the elements and win the favor of fortune and the fates. Instead I mostly got affirmations of what I already wanted to believe, platitudes and the impetus to spur the kind of self-reflection that fits well at the beginning of a new year. 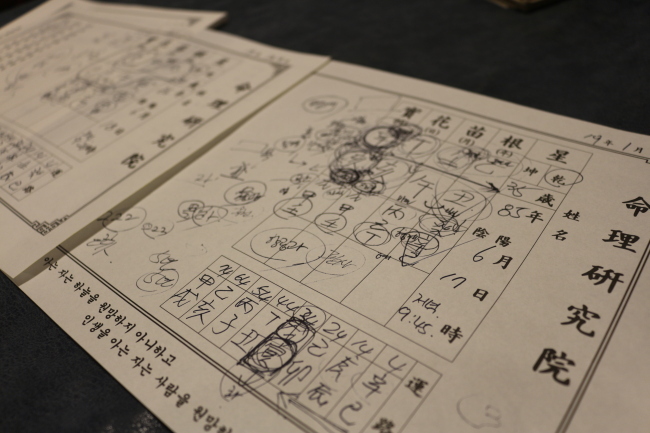 “Saju is written on the page, but it’s not a 100 percent sure thing,” Hyo-ri said before we wrapped up.